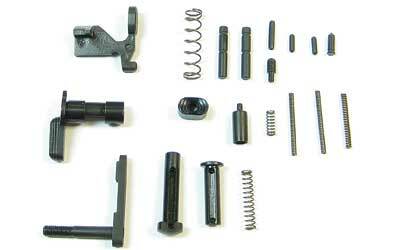 The CMMG AR15 Lower Parts Kit Without Grip & Fire Control Group is a unique lower parts kits for your stripped AR-15 lower. This kit features all the minor milspec parts typically used in an AR15 build giving you the ability to add common upgrades like a pistol grip or your choosing of a match grade fire control group. Why pay for stuff your just going to replace anyways, save it and put it toward the upgrades! One of the better kits I have used..
A guy like me ends up with all kinds of pistol grips that I will never use. I always use an aftermarket trigger as well. If you can find a kit like this, there are never trigger pins in it. The safety seems to snap when you change it from fire to safety. Most of them just slide over. Well built kit. Wish I could buy it in a 5 or 10-pack. I will certainly use these again.